The following post was written by Sarah Butrymowicz and was originally published on the Hechinger Ed blog of The Hechinger Report. What if the punishment for skipping school was a loss in welfare benefits for your family? It’s a strategy that some politicians are considering in the U.S. – plans have been floated in Missouri and put into action in Michigan last year. 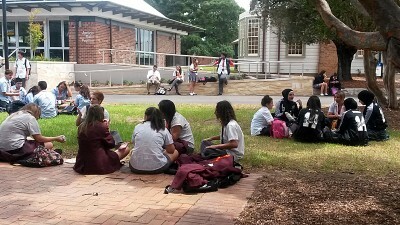 Australian students in their final year of high school take a break during a conference about what to do after graduation. The country is trying to boost its high school completion rates to 90 percent. But in Australia, they’ve already tried it, and the experience is a cautionary tale. In 2008, Australia’s high school graduation rate was about 75 percent, according to the Australian Bureau of Statistics. That’s about the same as in the U.S., where it’s nearly 75 percent, but it wasn’t good enough for Australian officials. Many states there allowed students to leave at the age of 15, following their 10th year of schooling and just before college preparation work begins. Thousands dropped out. So that year, the Australian government set a target of 90 percent high school completion. Within a few years nearly all states had increased the age to 17. Still, the Australians thought they should do more. To make sure all students stayed enrolled until they were 17, officials put strict penalties in place and a series of supports for truants, such as opportunities to work with social workers. Parents could also be fined up to $11,000. And, as a last resort, parents on welfare could lose their payments if their child was truant. The logic was simple: if parents needed the money, they’d make sure their child got to school. Attendance did improve in areas where the program was piloted, by about 5 percent. But a 2010 evaluation by the Australian Department of Education found that it decreased after an initial bump and low-income students still had lower attendance than their peers. Critics said that the increases weren’t enough to justify the cost of the program – about $3 million a year for the trial in 44 schools. At the same time, only a relatively small number of parents lost their welfare payments. In the first two years just 95 out of about 6,600 parents in the trial program were affected and all of them had their payments reinstated, according to the Sydney Morning Herald. In 2012, Queensland stopped cutting welfare payments to parents of truants because attendance didn’t improve. This entry was posted in About K-12 International Education News and tagged Australia, indigenous students, School attendance. Bookmark the permalink.